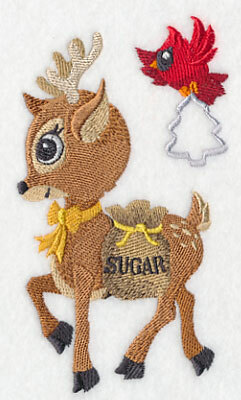 Step right in to Mrs. Claus's kitchen, and add a sugary-sweet look to Christmas gifts and decor! 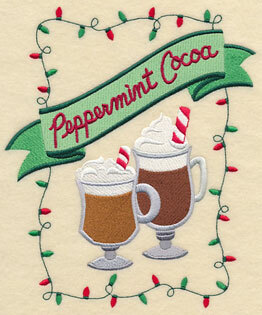 New machine embroidery designs are tasty and delicious additions to kitchen towels, aprons, and table linens. 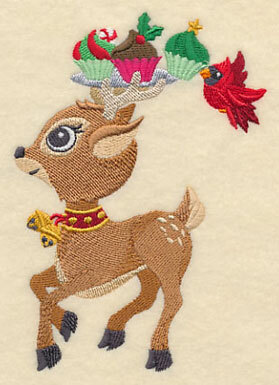 Add festive reindeer to placemats and table runners. 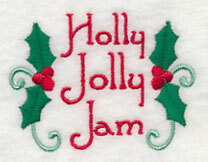 And, make embroidered jar covers for your homemade jellies and jams. 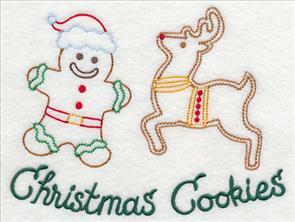 Stitch a personal touch for cookie exchanges and sugary gift bags. 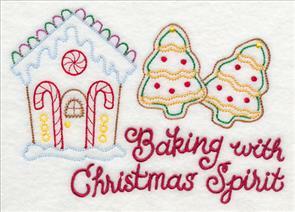 Create special aprons and towel sets for baking with family and friends. Scroll down the page to see these new sweet, savory designs! Use solids, prints, and embroidery designs in your projects with this layering technique! 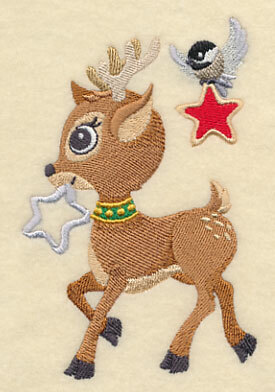 Seven sweet little reindeer help Santa and Mrs. Claus in the kitchen. Each are paired with an adorable bird friend. Reindeer bring stockings of peppermint candy canes, or trays of colorful cupcakes, with helpful bird friends following closely behind. 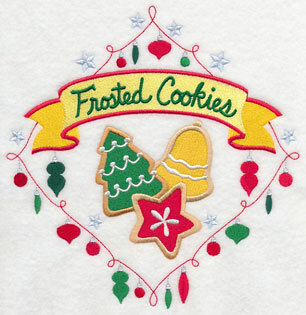 3.98" x 5.60" and 3.32" x 4.67" and 2.78" x 3.69"
Cookie exchanges are made much sweeter with embroidered towels! 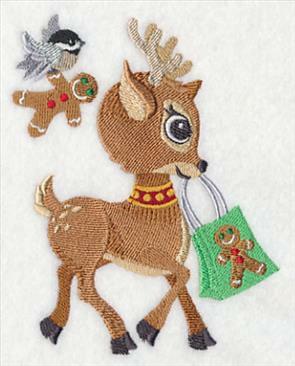 Add these festive reindeer, with their cookie cutters and bags, to terrycloth or linen tea towels. Then, tuck into a bag of cookies for a special treat. 3.29" x 5.05" and 2.75" x 4.21" and 2.33" x 3.48"
One reindeer brings flour, and another has sugar. A little chickadee and cardinal carries a whisk and a cookie cutter. A colorful way to add Christmas spirit to your kitchen! 3.00" x 5.25" and 2.50" x 4.38" and 2.18" x 3.56"
After a day of baking, relax with a cup of hot cocoa. 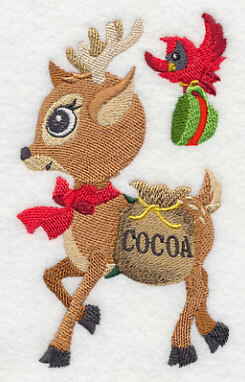 This little reindeer is a charming addition to mug rugs, placemats, and coasters, too. 3.05" x 4.99" and 2.54" x 4.16" and 2.21" x 3.46"
The seven reindeer are ready to prance into your kitchen and add sweet Christmas spirit! 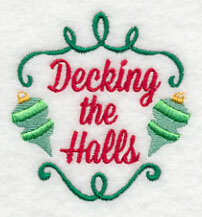 Embroider them onto kitchen towels, placemats, table runners, aprons, and more. Order the designs singly by using the links above. Or, get all 7 designs in a pack! Light-and-breezy designs are colorful additions to tea and flour sack towels. These designs have been drawn in a "vintage" style. 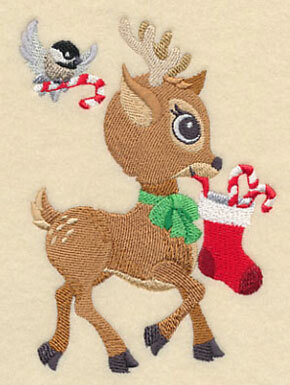 The stitch types are reminiscent of hand embroidery, but are deliciously quick on embroidery machines. Cookies and sweet phrases are paired together for a flavorful result. 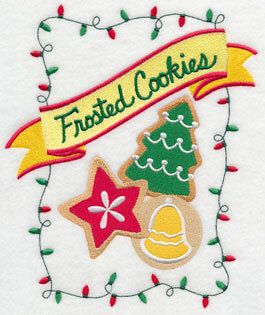 6.46" x 4.90" and 3.62" x 2.75"
Christmas cookies are decorated with a variety of stitch styles, making them eye-catching additions to tea towels. 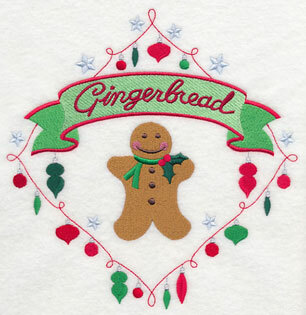 Or, embroider onto the bibs of aprons. Wear them at family baking parties for an extra-special touch. 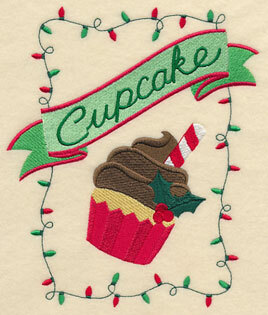 6.51" x 4.84" and 3.66" x 2.73"
Christmas cupcakes and gingerbread houses are festive and fun on tea towels, placemats, and other kitchen decor items. 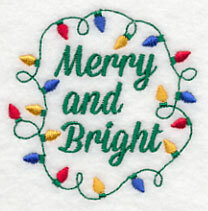 These light designs are fast to stitch, and bring a holly-jolly theme to your decor. 6.84" x 4.73" and 3.84" x 2.65"
A pair of gingerbread cookies bring a Merry Christmas message (or, for our European and Australian friends, Happy Christmas) to your projects. 6.35" x 4.87" and 3.57" x 2.72"
It's beginning to look a lot like Christmas, and soon the smell of cookies will be in the air! 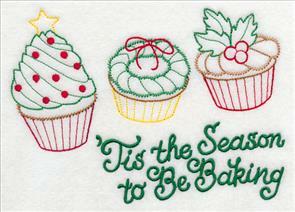 These designs on aprons and tea towels will bring a delicious look to your gifts and kitchen decor. You can get all eight designs in a pack! 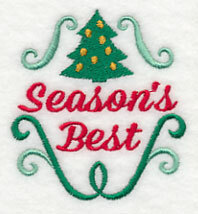 Last year we made "official" Christmas shirt designs, and embroiderers loved adding them to sweatshirt fronts for family events. 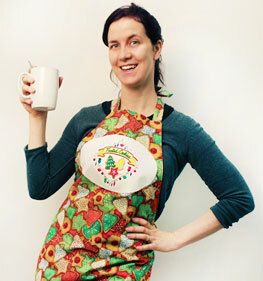 We received many requests to make apron versions for cookie tasting and baking. We love requests, and are happy to oblige! 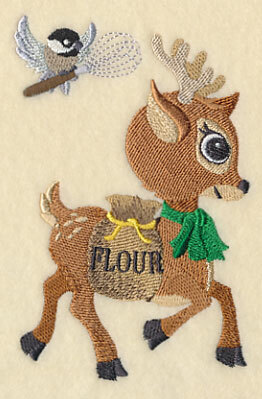 Below you'll find the official cookie tasting apron design, in both stitch-filled and applique versions. 11.00" x 5.24" and 9.40" x 4.48"
7.80" x 3.72" and 6.80" x 3.24"
11.00" x 5.29" and 9.40" x 4.52"
7.80" x 3.75" and 6.81" x 3.28"
Choose either stitch-filled or applique - whichever you prefer! 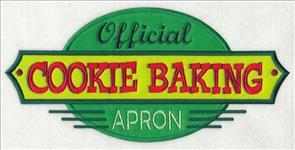 They'll be excellent additions to aprons for your family get-togethers, and cookie exchanges. 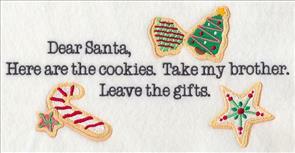 When you're setting a plate of cookies for Santa and his reindeer, leave him a special note, too. 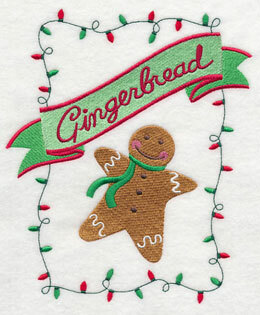 Embroider onto tea towels for a stocking stuffer that is sure to bring giggles and grins! 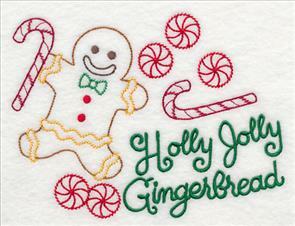 8.90" x 4.73" and 6.46" x 3.45" and 3.86" x 2.89"
Mrs. Claus's kitchen is decorated with sweet gingerbread, colorful ornaments, and bright red peppermint stripes and swirls. Bring some Christmas magic to your home with these designs! 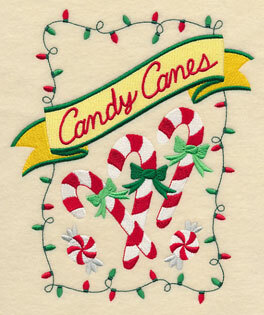 Diamonds and rectangles are framed in ornaments and lights, with sweet treats on the inside. 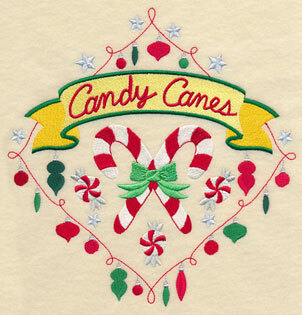 7.61" x 7.80" and 6.88" x 7.07"
6.52" x 7.80" and 5.86" x 7.01"
Red-and-white striped candy canes bring a fresh and flavorful look to kitchen towels and placemats. The diamond is a clever shape to tuck into the corner of a towel. 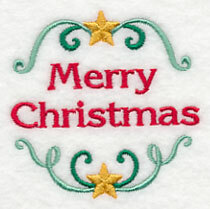 7.59" x 7.78" and 6.86" x 7.05"
6.50" x 7.78" and 5.86" x 7.01"
Embroider onto bibs of aprons, placemats, and towels. 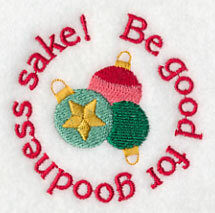 Or, use several in a Mrs. Claus's Kitchen-themed wall hanging! 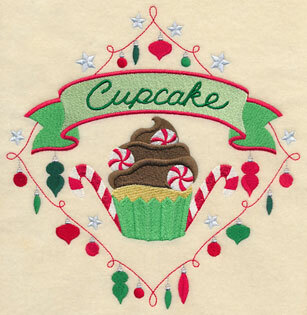 Make your gifts and exchanges of cookies extra sweet with an embroidered tea towel or apron! 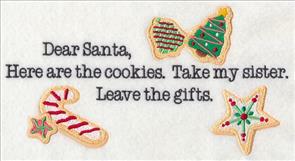 Wrap your cookies in plastic, then use the embroidered towel as the outer gift wrap. Crafty, and colorful, too! 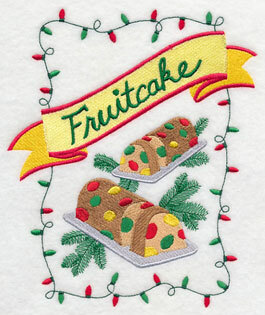 Festive and colorful, these designs are delightful additions to placemats, aprons, and table runners. Bring a delicious look to your kitchen and dining decor! 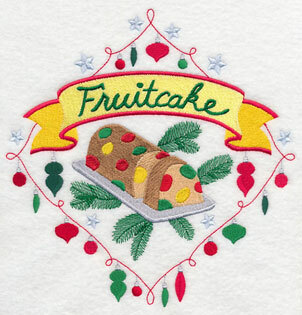 Fruitcake is a Christmas classic! Add the much-loved (and oft-maligned!) 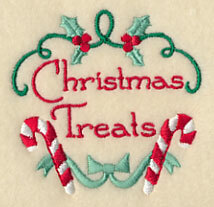 treat to kitchen towels, placemats, and tree skirts. 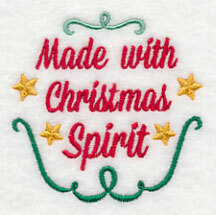 This light and colorful border of ornaments and stars is lovely on towels, placemats, and quilts! Repeat as many times as you'd like on tablecloths and runners, too. 11.72" x 3.20" and 9.38" x 2.56"
7.82" x 2.13" and 6.00" x 1.96"
both pieces smaller than: 3.02" x 1.63"
As well as using this border of lights on kitchen items, you can also use it on quilts, pillow covers, hemlines of skirts, and pashmina shawls! Repeat over and over again for colorful effect. 11.72" x 3.55" and 9.38" x 2.84"
7.82" x 2.37" and 6.00" x 1.96"
both pieces smaller than: 3.28" x 1.82"
Diamonds, rectangles, and borders bring the sweet look of Christmas cookies and decorations to kitchen towels, table linens, and aprons. Choose single designs by using the links above - or get them all in a design pack! Four sizes are available to suit a variety of projects. 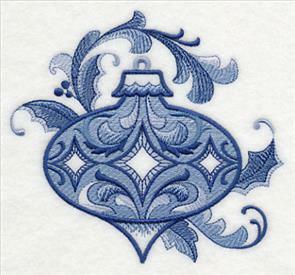 **XL - 18 designs smaller than 7.9" x 7.9"
**Lg - 18 designs smaller than 7" x 11.8"
**Md - 18 designs smaller than 6" x 10"
**Sm - 16 designs smaller than 5" x 7"
Seven ornaments, designed in the Delft Blue art style, are light and lovely additions to kitchen decor. Make a set of tea towels, or add to tablecloths and placemats. And, you can use these designs out of the kitchen, too! They're beautiful on tree skirts and stockings. 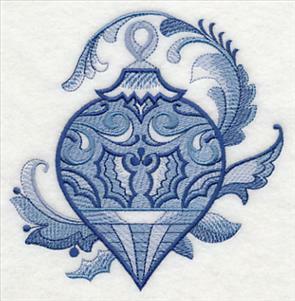 Delft designs are open in areas, so use on smooth fabrics. Canvas, denim, crepe-backed satin, linen, twill, and quilter's cotton, are all excellent choices. 4.88" x 4.86" and 3.85" x 3.84"
Each ornament features a different decoration, and is accompanied by graceful leaves and swirls. 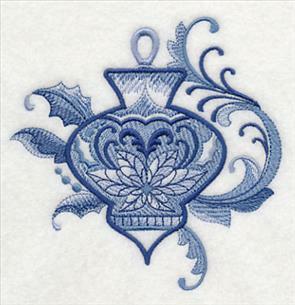 Beautiful, eye-catching additions on placemats, aprons, napkins, and more. 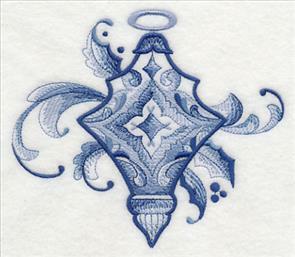 4.85" x 5.54" and 3.37" x 3.86"
Use all seven of these Delft designs on a set of flour sack or tea towels. 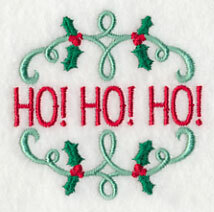 Add to the bibs of aprons, or quilted table runners. 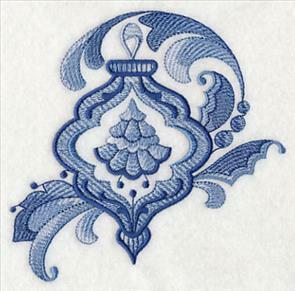 4.86" x 4.95" and 3.79" x 3.86"
Delft Blue embroidery designs use special shading techniques to achieve this beautiful effect. Some areas are light, and open. 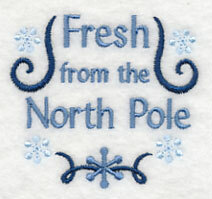 Embroider onto solid, smooth fabrics. Quilter's cotton, linen, twill, denim, and canvas, are all excellent choices. 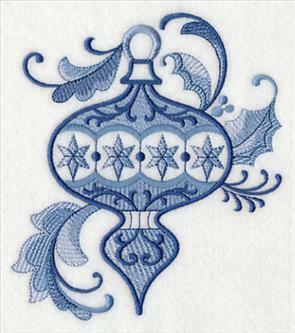 5.60" x 4.87" and 3.86" x 3.36"
Light and oh-so-lovely on tea towels, table linens, aprons, and more! Order the designs individually by clicking the links above, or get all seven in a design pack. These canning jar covers add a special touch to homemade jellies and jams. 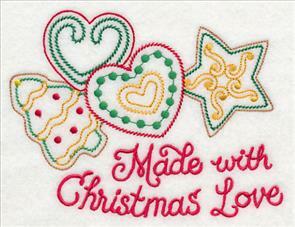 Stitch sweet sentiments onto your choice of fabric, then use as a jar topper! Project instructions are here, and they'll show you the simple steps. 2.67" x 2.66" and 2.02" x 2.01"
Jar covers have a variety of fun phrases. Each are paired with a classic Christmas element. Stitch a frosty snowflake, from the North Pole. 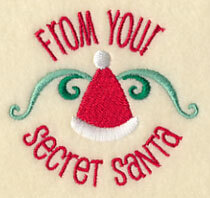 Or, Santa's hat, to represent a Secret Santa. 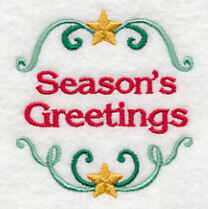 2.66" x 2.48" and 2.01" x 1.88"
Add a Merry Christmas message to your holiday gifts! 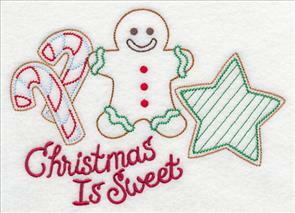 Embroider onto fabric, then add to jars of jam, jellies, fruit preserves, salsa, and more. Project instructions show you the simple steps to make this crafty gift. You can also use this design in other ways - such as stitching into the corner of a linen napkin, or adding to a coaster or mug rug. 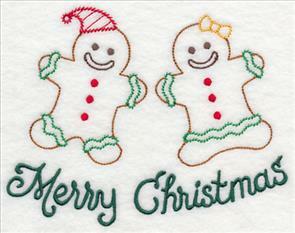 2.66" x 2.61" and 1.98" x 2.01"
The "Merry Christmas" design is shown above, but many of our friends in Europe, Australia, and New Zealand prefer "Happy Christmas." A version for that is shown below. 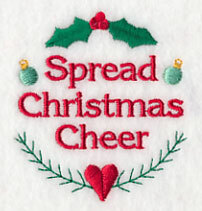 And, you can also send a message of "decking the halls," with colorful ornaments. 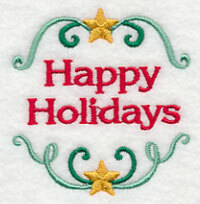 2.51" x 2.66" and 1.90" x 2.01"
Say "Happy Holidays," or "Season's Greetings," with stitches! Use these simple, seasonal designs as jar toppers. Or, tuck them into the corners of linen napkins and dishtowels, too. 2.51" x 2.61" and 1.93" x 2.01"
Santa's jolly "Ho! Ho! Ho!" is wreathed in delicate holly and filigree. 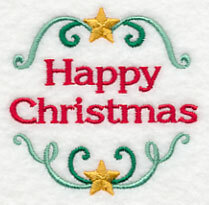 And, a Merry and Bright message is circled in colorful Christmas lights. 2.64" x 2.66" and 2.00" x 2.00"
These jar toppers are sure to bring smiles! 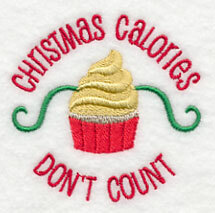 Stitch a message of "Christmas Calories Don't Count," or rate someone as "49% naughty, 51% nice." 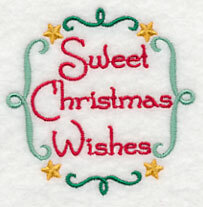 2.67" x 2.63" and 1.98" x 1.96"
Send your best greetings, or your sweetest wishes, with these designs! They're delicate and small for jar covers and toppers. 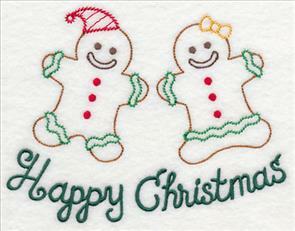 And, they can also be stitched onto napkins and tea towels for a delicate effect. 2.66" x 2.63" and 2.01" x 1.99"
As well as being used as jar toppers, these designs are charming on small stockings (or the toe tips of large stockings). 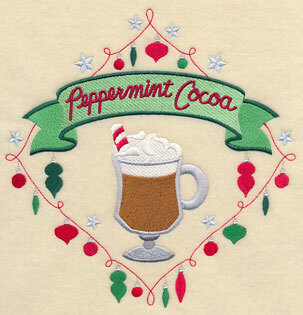 Embroider onto linen napkins, coasters, and mug rugs! 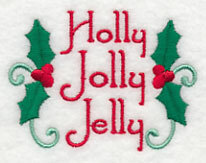 2.66" x 2.67" and 1.99" x 2.00"
Holly Jolly Jelly, and Holly Jolly Jam, are paired with colorful sprigs of holly. 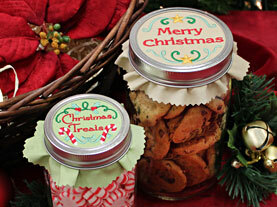 Make your homemade gifts extra-sweet with these designs as jar covers! 2.66" x 1.94" and 2.01" x 1.47"
Add an extra-sweet message to your homemade jellies, jams, and preserves. 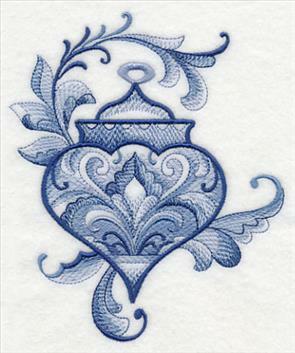 Embroider the above designs onto fabric, then cover a jar! Tie with ribbon. They're absolutely adorable in a gift basket. Order the designs individually by clicking the links above, or get all 19 in a design pack. 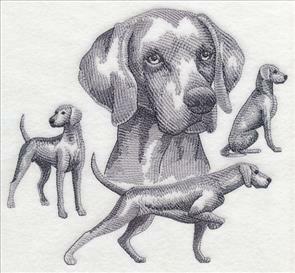 The pack is available in 2 sizes, both smaller than 4 x 4 inches. Click here for the larger, and here for the smaller. 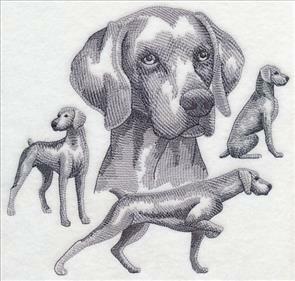 William Wegman is a photographer that popularized the Weimaraner breed of dogs in his many books and calendars. 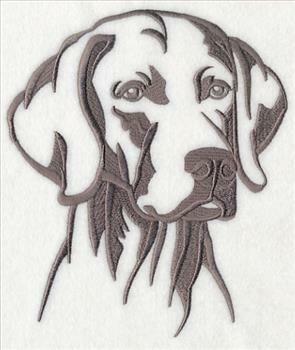 Ann and Susan are embroiderers who are quite fond of the breed, and requested sketch medleys with the breed. Two versions are available - with a docked tail, or a full tail. Thank you, Ann and Susan, for your suggestion! 7.80" x 7.31" and 7.37" x 6.90"
7.69" x 6.90" and 6.49" x 5.83" and 5.38" x 4.83"
5.86" x 6.88" and 4.86" x 5.70" and 3.29" x 3.86"